Our guide on starting a leather business covers all the essential information to help you decide if this business is a good match for you. Learn about the day-to-day activities of a leather business owner, the typical target market, growth potential, startup costs, legal considerations, and more! A leather business supplies leather goods and services to customers. Everything from high quality purses and handbags to leather repair may be available through a leather business. A leather business, much like other specialty businesses, looks to offer customers leather products and services. Therefore, knowledge of leather products, leather crafting, sewing, and repairs is recommended, if not necessary. Talking to customers and communicating online are also critical skills for building this type of business. Finally, experience in retail sales or retail marketing and promoting, preferably leather related, are also great bonus tools to possess in your skill arsenal. What happens during a typical day at a leather business? Whether you operate in a brick and mortar storefront or are making and shipping orders from home or a workshop, the majority of your day to day will consist of taking and processing customer orders and creating leather products for said customers. You will also spend some of your time interacting with your leather and leather product distributors and wholesalers. Last, but not least, your marketing and advertising efforts will have to constantly be updated and pushed to a larger audience. As a niche operation, it is critical that you keep current customers coming back as well as attracting new customers. Your target market will more than likely consist of customers who have purchased a leather items before. Although leather is popular, many consumers will shy away from animal products. Therefore, its critical to attract customers who appreciate durability, rugged, yet refined quality, and the look and feel of leather products. Some items can be reasonably priced, but most of your goods and services will tend to be priced below luxury, yet above department store numbers. How does a leather business make money? A leather business makes its money from the sale of leather and leather products as well as the repairing of leather goods, such as shoes and apparel, such as purses, suitcases, or briefcases. What is the growth potential for a leather business? Leather seems to retain its popularity, both as a stylish material and as a durable product, capable of remaining functional and posh for many years. Accordingly, a good quality leather business will find and retain loyal customers for many years. Sometimes, successful leather businesses can foster multi-generational ownership and profitability. What are some skills and experiences that will help you build a successful leather business? A profitable leather business must understand its customer base and their needs and should strive to stay aware of the changing fashion styles and adapt accordingly. You will need to be a student of the fashion niche you inhabit. If purses and handbags are your specialty, or your focus is shoes, gloves, and jackets, stay knowledgeable of the industry around you. Make your business your business. You will also find that communication is key to building and expanding your customer base, as well as developing relationships with your leather wholesalers and distributors. Communication will also help you in the marketing and promoting of your business. Equally, you will need to stay aware of sewing and crafting techniques and equipment and continue to add to your repertoire to develop fresh ideas and designs. What are the costs involved in opening a leather business? It is possible to get started in a leather business for a relatively low overhead, depending on your focus. If you are selling some pre-crafted items online from your home, you will need to spend most of your money on building up your stock. Handbags, purses, gloves, and smaller leather items can be purchased wholesale and stored in your house or other storage options until being shipped to customers, as the orders are received. You will need some sort of forum for reaching customers, such as a website or access to online retail options, such as eBay or Poshmark, for example. If you choose to operate out of a storefront, you will need to factor in the costs for rent, utilities, and business insurance. Although this will raise your overhead costs, you may reach more customers, depending on the location of the store. 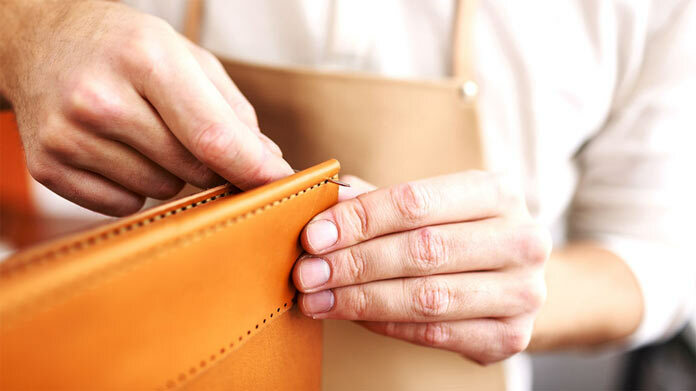 If you are creating your own leather products or offering service and repairs for leather goods, you will need to add the costs for materials and equipment, such as an industrial sewing machine, leather needles, cutting tools, and patterns. What are the steps to start a leather business? Form a legal entity. Establishing a legal business entity prevents you from being personally liable if your leather business is sued. Open a business bank account. A dedicated checking account for your leather business keeps your finances organized and makes your business appear more professional to your customers. What are some insider tips for jump starting a leather business? Marketing and advertising to create a name for yourself might be one of your biggest initial hurdles. Even if you are an amazing leather artist, if nobody is aware of you, your efforts will be for not. Design and build a website with the help of a trusted web page designer. Create a social media presence through Facebook, Instagram or other relatable sites and be vigilant about showing your work. There are lots of outlets for leather products, so you have to make sure yours stands out and is memorable, as well as accessible. It is also advisable to do research into the viability of such a business. Research your competition, both regionally and style-wise. You don’t want to oversaturate a niche market. And, if there is some competition, find out what they don’t offer and focus on those areas. Once you’ve made your name, you can expand to more areas you may have originally considered, when you were starting out. Finally, find a way to be competitive in your pricing without being too cheap or too overpriced. The right wholesale distributor connection may be the make or break point for your business. As mentioned above, create an online presence through social media and a website. This allows you to garner customers from all over the world, which will help your name and reputation exponentially grow. You might also want to gain membership to leather guilds and organizations. The connections created should be beneficial to both parties. Also, visit crafting conventions and trade shows help show off your wares and abilities. Reputation is so important. Make sure you’re prompt with your work or shipments and always maintain a professional and courteous attitude with customers and vendors. You should also strive to offer your customers the best designs and products. Avoid becoming complacent with your work, as customers will flee from stagnation. Fortunately, a business such as this one can successfully be operated by a single person. Especially if you sell and operate online, without a storefront, you will be able to handle the billing and shipping, for the most part. Adding team members usually occurs as the business continues to grow past the two to three year mark. When you are financially stable and still expanding, bring on another person to help with logistics. This will free you up to focus more on the creating and acquisition of product. If you do open up a brick and mortar location, you, plus a couple employees to start, should suffice. Again, as your business grows, so will your staff. Certain state permits and licenses may be needed to operate a leather business. Learn more about licensing requirements in your state by visiting SBA’s reference to state licenses and permits. A leather business is generally run out of a storefront. Businesses operating out of a physical location typically require a Certificate of Occupancy (CO). A CO confirms that all building codes, zoning laws and government regulations have been met. Before leasing, confirm that your landlord has or can obtain a valid CO that is applicable to a leather business. Review all building codes and zoning requirements for your business’ location to ensure your leather business will be in compliance and able to obtain a CO. Client pricing will depend greatly on what you’re selling and offering. Research competition thoroughly to see where your price points will fall. Some high end leather bags will range upwards of five figures, whereas leather glove repairs may only fetch $10-20. Understand what you’re offering and charge accordingly. What are the ongoing expenses for a leather business? Most ongoing expenses will pertain to materials and finished resale products, especially if you operate online. A store location will add rent, utilities, internet and phone and some advertising. How much profit can a leather business make? Depending on what you sell and what services you offer, you can see earnings in the $30,000-40,000 range, especially if you are able to keep your overhead costs low. Offer related products, such as leather cleaning and care oils and solutions. Sell these items in conjunction with your orders and many customers will continue to purchase the products, even without buying more leather goods. If you are an accomplished leather worker, offer specialty designs and custom builds. You can charge a premium price for your services, as it will be an additional source of revenue, and not the primary moneymaker.